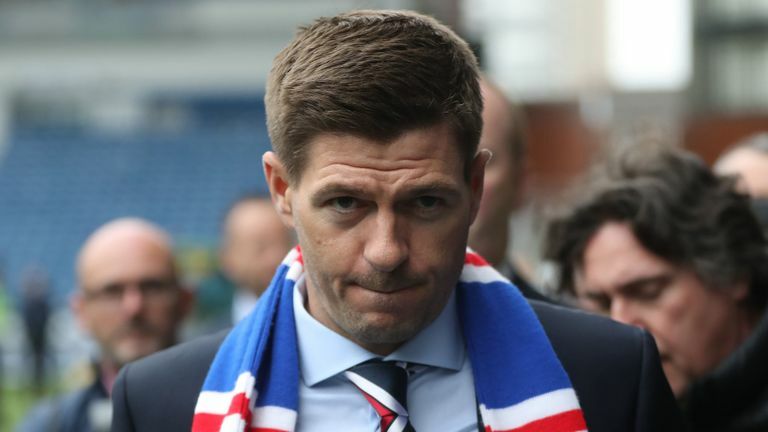 New Rangers manager Steven Gerrard has wasted no time at all laying into his disjointed rabble of a squad and informing them, Souness-esque, that they’re playing for their Rangers lives and anyone without the stomach to fight for the club can leave by the exit. The Anfield legend showed during his press conference how much business he means, and took absolutely no prisoners during his comments about his own convictions and expectations, showing the same fighting spirit he had during his playing days, but it is the comments in the subsequent days we appreciate even more. For too long we’ve had wet managers in charge of this club – unworthy men who simply were not of the right stuff to handle the size and pressure of the Famous. This was a systematic failure by the board as well as on said managers’ part too. But with Gerrard, we have someone who is simply not going to tolerate anything less than 110% for Rangers. "I can't have that [weakness]. That's got to stop. That's got to stop now. I'll work out quickly who fancies this challenge and who wants to come with me. If there are people who don't fancy it and want to be somewhere else and don't fancy adapting to what we demand, good luck to them. If you are not a hungry footballer, you shouldn't be at Rangers. Simple as that." With 20+ years at the highest levels of the game, and only just recently retired as a player, Gerrard has a pretty keen sense of what players he knows will give everything for him and the shirt, and what ones can be discarded. The site discussed our ideas of who might go, and who might stay, but Gerrard is taking no quarter when he looks at the squad and will have the ruthlessness we need to go forward. He is definitely saying the right things, and at this point is reminding yours truly a little of the style of Atletico Madrid’s Diego Simeone. Someone who the players will run through walls for, and really remains one of them, but who isn’t afraid to bin anyone he thinks isn’t up to the challenge. Whether Steven Gerrard will turn out half the manager the ex-Fiorentina boss has remains to be seen. Dave, ship out to who? Most of them, really deserve to go, after the way they've played this season. They are not worthy of the Club. The Union Bears said it best. Can they really 'expect' to be playing, next season for us? Not most of them. Pena the "wage thief" should be numero uno and Morelos, 2nd. Then cut out the rot, right to the bone. No time for weakness, when you're trying to rebuild a famous football team. If Dave king came out and said we have 30million or more clubs would hold us to ransom when we try to buy there players,king is correct not to say what we have. Yes Steven, you are correct. We need five or six for real improvement. It may involve loans and bringing in two or three top class winners on big bucks. That is how I see it working out. Rome wasn't built in a day and it will take a few weeks for a team to gel but from the first kick of the ball next season Rangers will be up for it. Do not doubt that for a moment. By the way I am buying four new strips for our family first day they are available. We're back. Talk of imminent new external investment was ruled out by King, who said: "At this stage, there is nothing external other than existing shareholders and investors. Only 3 words from that statement we should all take notice of "AT THIS STAGE" the 2 vacant seats that are avalibile on the Board will be filled by people that will be investing in the club, it will not be the Sultan of Brunei throwing 100s of millions at the club, but investment WILL happen. Stevie & Allen know right now what the transfer kitty they have, 25/30 million will be made avalibile to them both. Players will be sold and that money will also go back into the kitty. No way on this earth Stevie is joining Rangers on the back of a 6m kitty, not a hope in Hell. King I understand U don't want other teams to hold us to ransom, but a bit more transparency would have been nice. Mr King you are hard hard work Sir!! Sound stuff from our chairman. Telling the world our new manager will be shopping in a hurry with a bumper kitty would be unwise to say the least. The £6M is already in use but the club don’t have to pay it back. It’s good but not box office. Gerrard & Gmac will have a few guys in mind and will no doubt bring some quality from down south on loans. Add that to the apparently done deals of McGregor & Arfield. Whilst there are some in our squad who are clearly not of the calibre, there will be a better than good chance a good number will take their game up a level or 2. Or they’ll be sold. It was never going to be £30 ~ 40M, clear the decks and bring in 10 players. £10 ~ 15M net spend could be possible on our income. How many players that equates to is anyone’s guess, with consideration to who we sell and for how much, loans, out of contract buys etc. Could yet be a new team or somewhere close. Going after investment at that stage may be best when our squad had been transformed with our own funds. It would potentially strengthen our hand in those deals rather than now and risk getting tied into less favourable deals for years to come. The bottom line is the great unwashed are nowhere near as good as they think. Europe tells you that. Aye they have money for a dozen new players but only 11 can play at time and I for one believe we can take the title without busting the bank. Again. Is this wishful thinking or do you know this? It would be great if it was true , but Kings track record goes before him. The money will be made avalibile for them! Rangers need to start the way they need to go on. Getting beaten is not an option ,Centre half is needed, with Declan John at left back, Rossiter needs to prove himself ,Scott Arfield will add steel to Midfield with Ryan Jack/ Graham Dorrans/Jason Holt/Windass/Murphy/Candeias/ and a big money c/forward as Morelos seems to have lost interest.